Today's writing prompt asks if I carry any good luck charms? There are cultures where the contents of the medicine bag are kept private, as that information can be used against the wearer. Who is my spirit guide? I'm not telling! But my personal traditions are different and I have no fear of these being stolen from me. There are two items I wear nearly every day that have special meaning. The first is a topaz necklace, the inheritance from my mother last year. As grim as it can be tucking away a loved-one for the last time, this small gift has turned out to mean more than I could have imagined. Mom used to take it out at our visits, reminding me where she kept it and explaining that I was to make sure this keepsake and my sibling's were to be delivered where she intended. I hated those reminders when I visited, because I was far less interested in her death and her gifts, than spending time with her living self. But it sure was helpful when the time came to know of that envelope, where it was, and what mom intended. I wear that necklace often, and it turns out to remind me more of all the good things that mom added to my life. This little necklace covers over bitter memories, leaving me comforted and at peace. A good and appropriate inheritance. The other talisman is a Run Happy band from Brooks. Kind of for obvious reasons. 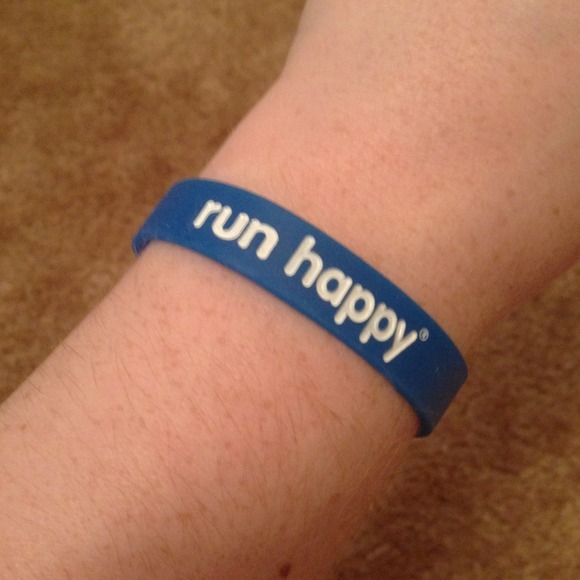 Running is part of my new life, and this silly band reminds me.